Full-electric and hybrid drive vehicles face new torsional vibration challenges. Instant full-torque induction creates stress on a driveshaft and induces unwanted NVH from backlash against the drive gears. Incorporating a torsional viscous hybrid drive damper is a cost-effective, long term solution. Vibratech TVD has collaborated with leading world transit bus manufacturers to resolve NVH through developing optimized narrow frequency driveline dampers. As more passenger and off-highway vehicles adopt the efficiency of hybrid and full-electric drives, Vibratech TVD is experienced and capable of adapting a driveline viscous damper to new configurations. 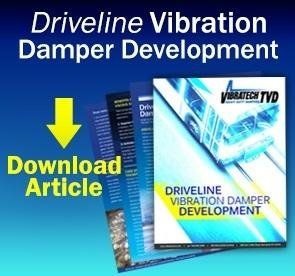 Vibratech TVD recommends that OEMs do not use a viscous crankshaft damper in the research and development of drivelines and rotating shafts. The crankshaft damper may not provide optimum results. Contact Vibratech TVD at +1 716-592-1000 for driveline damper consultation. Vibratech TVD was approached by a major manufacturer of mass transit vehicles to analyze, test, engineer and manufacture viscous dampers to eliminate driveline torsional vibrations causing unacceptable NVH throughout the cabin. Vibration Damper Case Study: Transit Bus Hybrid Drive. Vibratech TVD Driveline Vibration Dampers.